Larvae feed on the lower surface of the leaves, leaving only a fine network of veins which gives the leaf a transparent appearance. 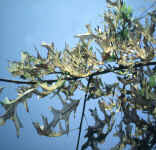 Defoliation starts in the upper crown in early summer and progresses downward. By late summer, heavily infested trees may be completely skeletonized. Larvae overwinter in cocoons in the litter layer, and adults emerge in the spring. The adults, which resemble small fly-like insects, are about 6-8 mm long and are black with light yellowish legs. Females lay eggs in rows in the lower leaf surface along the sides of the midribs and larger veins. Eggs hatch within 1-2 weeks, depending on the temperature. 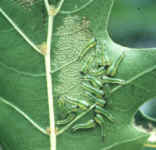 Several larvae feed on the same leaf. Full-grown larvae are slug-like, yellowish-green, and about 12 mm long. There may be two to three generations per year. Microbial diseases and other natural enemies generally keep the sawfly in check. In outbreak years, insecticides may be needed on high-value trees.